(VIDEO) Longtime faculty member, administrator began tenure on the Lubbock campus in 1982. Texas Tech University System Chancellor Robert Duncan announced today (July 7) the official appointment of Provost Lawrence Schovanec as the 17th president of Texas Tech University. The announcement follows today's special called Board of Regents meeting and vote to affirm Schovanec as university president. Schovanec will officially begin the role Aug. 1. 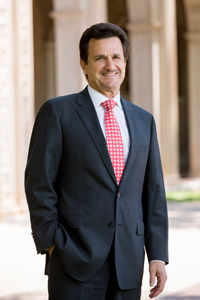 Prior to his appointment, Schovanec served the university as provost since December 2013 and was interim president from July 2012 through March 2013. Schovanec succeeds John Opperman, who has served as interim president since January. 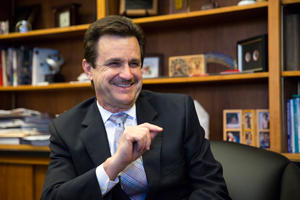 During his time as provost, Schovanec helped strengthen Texas Tech's position as a leading national research university. In 2016, Texas Tech was recognized by the Carnegie Classification of Institutions of Higher Education as a Tier One university in the Highest Research Activity category. The university also was recently reaffirmed for accreditation by the Southern Association of Colleges and Schools Commission on Colleges. Before being named chair of the Department of Mathematics & Statistics in 1998, Schovanec was a faculty member in mathematics since 1982. He served as interim dean of the College of Arts & Sciences from September 2008 through May 2010, when he was named dean. He has received the President's Excellence in Teaching Award and is a member of the Texas Tech Teaching Academy. Schovanec earned his doctorate in mathematics from Indiana University, his master's degree from Texas A&M University and his bachelor of science from Phillips University. A widely published author, Schovanec's work has appeared in numerous academic journals, and he has spoken extensively at professional conferences. His research interests are in the fields of biomechanical and physiological control systems and solid mechanics. He has received more than $3.2 million in external funding for his research. A nationwide search was conducted to identify candidates for the presidency. The Board of Regents voted to select Schovanec as sole finalist June 16 after conducting interviews with candidates and considering recommendations from Duncan and the presidential search committee. State law requires 21 days to pass before final action can be taken by a university governing body for the official appointment of a president. The search and selection process for the new president of Texas Tech University began following M. Duane Nellis' resignation in January. on the Texas Tech University campus.